If using classic crust: Heat oven to 425°F. Lightly spray or grease large cookie sheet. If using thin crust: Heat oven to 400 F. Spray or grease 15x10-inch or larger dark or nonstick cookie sheet. Unroll dough on work surface. With sharp knife or pizza cutter, cut dough into 4 rectangles. Place rectangles on cookie sheet. Cut 1-inch slit in center of wide edge of each dough portion; on opposite wide edge across from slit, pinch dough together to shape point of heart. Slightly separate each cut slit, and gently press dough into a 6x5-inch heart, creating slight rim on edge of dough. 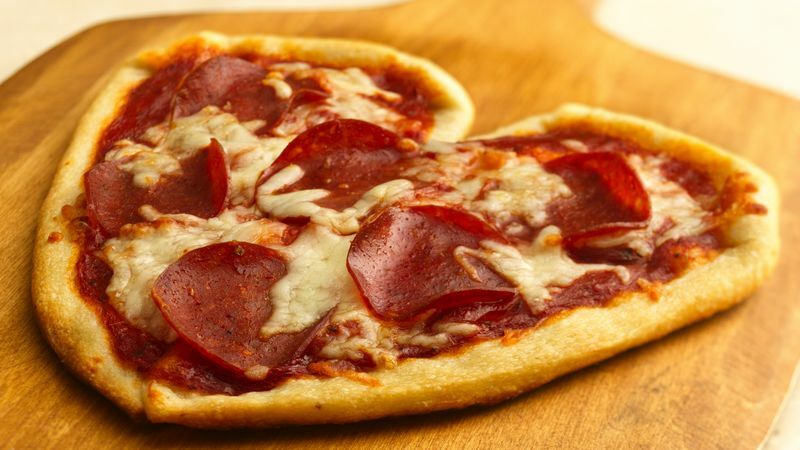 Divide pizza sauce evenly onto hearts, spreading to within 1/2 inch of edges. Top each with 6 slices pepperoni and 3 tablespoons cheese. Bake classic crust 13 to 16 minutes, thin crust 9 to 13 minutes, or until crust edges are golden brown and cheese is melted.